Chris Welch writes....I only heard about this through Doug Alexander on Facebook. Thanks Doug. RIP #GeorgeWarnock -- a significant passing yesterday (5.25.16) at 98 y/o. I learned so much from his writings. A true feast for the spirit. They set a template in my Spirit that can't be removed. More than instruction... I was fathered by this faithful scribe's pen into the true spirit of sonship. Have read his classic FEAST OF TABERNACLES several times. Double honor to your humble servant dear Lord. I just found out that a grandfather of the faith, George Warnock, has passed into glory at over 98 years old. Here was a man who, like Simeon, waited patiently for decades to see the light to lighten the Gentiles and the glory of Israel, which he was shown many years ago. 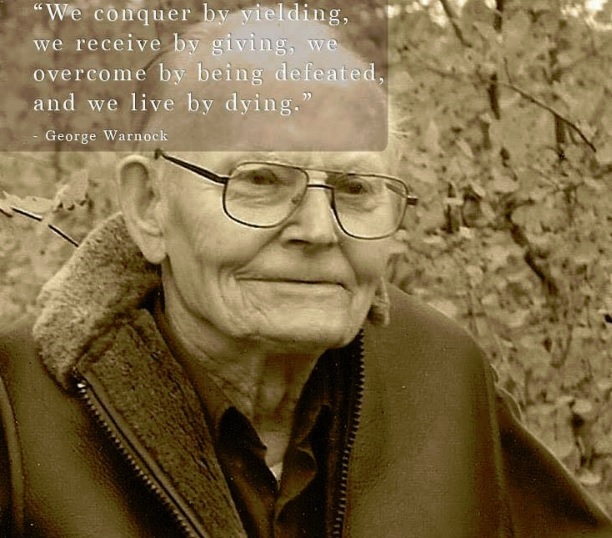 He was a teacher, an author of 14 amazing books (available for free - see http://www.georgewarnock.com/, a father of 7 children, and an inspiration to me. I was blessed to travel to his beautiful home in Cranbrook, British Columbia, Canada twice - once in September 2001 (shortly before 9/11) and again in 2003, with Wendy. George's wife of 55 years passed into glory 4-1/2 years ago, and now he has followed. Truly, with long life he was satisfied and shown the LORD's salvation. He is survived by 7 children, 19 grandchildren, 5 great-grandchildren, and hundreds if not thousands who grew in their faith through his faith and teaching gift. Rest in peace, man of God. "Another Pioneer has been called home at age 98. Bro. George Warnock whose book, The Feast of Tabernacles, should be requisite reading for all seeking deeper truth about the Kingdom of God. Just learned that a brother who has influenced multitudes (including myself) through the profundity of his writings has passed from this realm to the next. George Warnock, author of the book, “The Feast of Tabernacles,” was called home Monday at the age of 98. What a humble servant of God he was! "Our Canadian friend and sojourner in Christ, Terry Miller, sent a notice of the passing of of George Warnock, author of “The Feast of Tabernacles,” “Hyssop That Springeth Out of The Wall,” and many more books. He was certainly one of the pioneers of today’s present truth who impacted the body of Christ in a mighty way. Br. George H. Warnock, who was called home yesterday at the age of 98, "received" the following poem in the early years of this Move of the Spirit. He said, "I awakened one morning with these words running through my mind..."
And do His bidding is my choice. Led of the Spirit, not of man. I'll walk with Him, I live in God. Hearing the still small voice within. I'll hear His voice when I awake. I'll share His cross... and live again. REST IN PEACE. WE'LL MEET AGAIN WHEN ONE DAY ALL THE SAINTS OF GOD ARE GATHERED HOME. I was born on September 22, 1917 - to my parents, David Edmond Warnock and Alice Pearl (McCann) Warnock, who lived in North Battleford, Saskatchewan, Canada. I was the third of five children. A younger sister passed away a few years ago, my older brother and sister are still living as well as a younger sister. Our father was a carpenter in that town. We lived in a small home on the outskirts. Being the son of a carpenter, it was not unusual that I learned the trade early. For reasons I had not planned, I also took up the trade. I remained a carpenter during most of my life, after my school days. As children we had a good Christian upbringing, for which we are all very grateful. We learned about Jesus as soon as we could talk. As we grew older, we knew that we must, as individuals, come to know the Lord personally and surrender our lives to Him. We all came to the Lord early in life. I think I may have held out longer than any of the others. I was 19 when I made a public stand for Christ. Almost instantly I had the assurance that I was "saved." The joy of having this assurance flooded my heart. Within the next 10 days or so I was baptized in water in the Name of the Lord Jesus Christ. Before this, I read the New Testament all the way through (except for a couple of chapters at the end of the Book of Revelation) just to make sure that this was the way the disciples baptized their converts. In our small town there were a lot of churches…but many people longed for a greater reality than they had discovered, and would not hesitate to leave one church to attend another, as they sought for the "better way." Our folks were of that mind, and I can recall in those first 20 years of my life, having attended many different churches: Pentecostal, Nazarene, Holiness Movement, Christian and Missionary Alliance, Salvation Army, Four Square Gospel, Apostolic Church of Pentecost- and often we were involved with an Independent church group. Our folks were never denominationally minded, and none of us grew up with the thought: "My church is the right church." Eventually our whole family moved to Vancouver. My brother was the first to do that, to attend a Bible School in that city. Then later the rest of us moved there - and our family was together again. I worked with dad quite a bit…as finding a job was not easy in those days. Then came World War II, and being in good health, it was inevitable that I would be called up. In the meantime I had been called before a committee that was appointed to decide whether or not one’s claim as a conscientious objector was valid. Because I had no affiliation with a church background that resisted going to war, there was no place for me as an "objector." I had total peace in the decision I had made: I would not kill my fellow-men, nor would I undergo military training to learn how to do so. In due course I received my order (along with a ticket) to report at the army training center in Victoria, on November 22, 1940. I wrote them a respectful, but firm, letter explaining why I would not be there on the appointed day. I closed my letter with a statement something like this: "When I received the Lord Jesus into my life, I determined to follow Him the rest of my life, regardless of the consequences." I didn’t go into hiding. They had my address and I expected I would be "picked up" almost any day. But for some reason I heard nothing from them for several months. Then I got my notice to report for Alternative Service in a forestry camp... set up to handle COs of many denominations. They were mostly Mennonites, but there were several from other backgrounds: Seventh Day Adventists, Christadelphian, Jehovah’s Witnesses, Hutterites, Brethren, and "Independents." We were in camp four months, released for a short season, and then sent to other work camps, or forestry camps, for the duration of the war. We did not know what to expect until we got to one of those camps. They were civilian camps managed by one or two foremen - some of whom were veterans of World War l. We had no armed guards, nor were we kept in fenced compounds. We were detained on our honor, were required to put in an 8-hour workday, with weekends off. We were treated well and respected by our foremen. (At least this is the way it was in the camps I was in.) Later some of us were given the option of going to one of those isolated places where industries found it difficult to keep the crew they needed, as men could almost pick and choose the job they wanted. I volunteered for one of these, and was sent to Pacific Lime Company on Texada Island, a few miles west of the mainland of British Columbia. We remained under Alternative Service regulations…but worked along with the employees in the plant. The company was not subsidized by our cheap labor ($25. per month plus board). They were required to pay the going wage, we received the $25, and board allowance, and after taxes and other deductions -- the net balance was sent to the Red Cross Society. For a short while I fired one of those large furnaces with cordwood, that burnt the limerock into lime. Then I was taken into the office as Timekeeper, and later when the local accountant at the plant resigned, I took his job. We had freedom to gather for church services, and I met with a group comprised mostly of Mennonites who knew the Lord, and some other evangelicals…Brethren, Baptist, Pentecostal…or Independents. I also had freedom to share with them from time to time, and we had some good times of fellowship. We remained under the Alternative Service jurisdiction for several months after the War ended, and were then finally released in August, 1946. From early childhood I had only one thought in mind, as to how I would spend my life, and that was to become involved in the work of the Gospel. I think the fact that I was raised up almost from death, had much to do with the thought I had: did God raise me up for a purpose? I was around 5 years old when I came as close to death as one could come…with pneumonia and other complications. Finally one day my dad took my sister by the hand and they walked down to the Canadian National railway station and dad sent a telegram to his mother-in-law (my maternal grandma): "Please pray for Georgie, he is almost gone." My grandmother was "baptized with the Holy Ghost and Fire"…as I often heard her say years later. It happened in the great Pentecostal revival that swept through Winnipeg, in the early part of the last century. Out of that experience the Lord Jesus became her Lord and King, her Saviour, her Provider, her Great Physician. They were on a homestead far removed from the help of a doctor. One time one of her sons lay dying on his bed with a ruptured appendix. She looked for no help other than her Great Physician - and her son was raised up, and lived to be an old man. A cow or a horse that was sick - she would go to the barn and lay hands on them, and they would be healed. Anyway, when she got the telegram she went to fervent prayer immediately, and I was raised up by a miracle. I sat up in bed that very day, and gradually returned to full strength. Oh how great and majestic and powerful the Church appears to be in our day. But in actuality…how weak, how poor, how miserable, how blind, how wretched she really is. And our Lord stands at the door, and begs for admittance, that He might come to us with the "white raiment" of His righteousness, with the "anointing oil" for our eyes…with the "gold, tried in the fire"…that we might be rich. So now I am released from the work camps, and back in Vancouver. What will I do? Prepare to be a missionary, perhaps. I looked into the possibility of going to Japan. I was serious about it. But I soon learned that "A man’s heart deviseth his way, but the Lord directeth his steps" (Prov. 16:9). We plan our way in life…but He lays our plans aside, and directs us in His way -- if we truly love God and desire to walk with Him. One night at the church that I attended, while the Spirit of God was heavy upon me, I had clear direction to move to Lethbridge, Alberta. For what purpose I did not know. For about three years in that city I was involved with a handful of people, mostly in downtown mission work. My time there seemed to be very unfruitful and uneventful. Yet I would have the assurance in my heart that I went there in His will. While living with friends in their home I felt to go on a long fast…as long as would be necessary to discover a greater reality in God. Then one evening an old Pentecostal preacher who was a friend of our family, looked me up. After a time of fellowship with the family members that were in the room, he came over and laid hands on me and prophesied words of encouragement. I thought that was quite strange…I never had anything like that happen to me before. Shortly after this we heard about a move of God starting up in Saskatchewan, in my old hometown. It was a time of great spiritual dearth, and many of God’s people in many places had been earnestly seeking the Lord for revival. In North Battleford a small Bible College had been formed, and the faculty and students alike were constrained in earnest prayer and fasting to seek the Lord for a fresh move of God. This went on for months and in the Spring of 1948 the Lord began to move very sovereignly in "prophecy and the laying on of hands" - with the impartation of gifts and ministries of the Spirit. Then we heard that a Camp Meeting was scheduled for July and some of us in Lethbridge felt to be there. We were not to be disappointed. There was a great emphasis not only in prophecy and other gifts of the Spirit but we were greatly impacted by the evident presence of the Spirit, the anointed Word in teaching, and the spontaneous prophetic utterances that came forth. It was a corporate anointing - with the Spirit Himself very much in control. The people as well as the leadership were participants in this fresh anointing. To myself and many others it was a new day dawning. A day in which the Lord would unfold Truth in a new dimension, for the edifying of the body of Christ. The revival had started in February of 1948, in what was known as Sharon Bible College, and now it was early July. In those 4 or 5 months the word had gone far and wide, and there were probably six or seven hundred people there from different parts of Canada and the USA. The "order" of the Spirit prevailed, and there was much love among the brethren. It was a new visitation and in the days and years to come, many thousands would be refreshed and changed as they discovered new vision and new hope in what God was doing and would yet do in the earth. The Word became "alive." The worship was spontaneous, as those who had long panted for the living waters found new hope and new reality in God. A few months later, at the request of one of the leaders…I was invited to come and work with them…particularly in the office answering the mail that started to pour in from different parts of Canada and the USA and other countries. I enjoyed those times, and have no regrets for having worked there those four years or so, in what I would call a "deacon" capacity…helping out where I could…ministering at times in the local church…or in the Bible College. It was during that time that I wrote the book "Feast of Tabernacles," which was inspired in part by what one of the young prophets had said in one of his classes; "This feast is still in the future." It was this key that started my own research into this great Feast, and I was aware of much anointing as I wrote about it. But after a few years I was becoming more and more aware that the Spirit of God no longer hovered over us as He once did. Several others felt the same way. God forbid that I should attach any blame to anyone…He alone is the Judge. Perhaps all of us who were involved, were responsible in one way or another, for causing the Holy Dove of God’s Spirit to be grieved. I knew I must leave…but I never lost confidence in what God had done, and would yet do…when a new generation would earnestly seek the Lord to come again, and set up His habitation in the midst of His people. I went back to my trade as a carpenter, and remained at that till I was well-past retirement age. Yet during this time I would occasionally take a ministry trip here and there, as I felt it to be the Lord’s will. On one of these earlier trips I went to a small gathering in Oakland, California…and I stayed on after the gathering working at my trade. Then in 1956 I came back to Canada to marry Ruth Gray, who also was born and raised in Saskatchewan, and used to come with her parents to those annual summer Camp Meetings. After we married we returned to California for another couple of years where I had unfinished work to do. Then I had agreed to build a small summer home near Lake Tahoe. After that we returned to Canada…with our firstborn child, a daughter, Linda Faith. We lived in the Calgary area for 14 years and have lived here in Cranbrook since 1972. Ruth has been a faithful and devoted wife all these years, and we have been blessed with 4 daughters, 3 sons and 17 grandchildren. In 2005 we were saddened with the passing away of a grand-daughter, Rebekah Grace, at the age of 15. She had been handicapped for the greater part of her life. Her passing has left a void in the hearts of many. Our father George is nearing 98 in September, nestled away in the Canadian Rockies; a grandfather to 19 and a great-grandfather to 4, with another on the way. His beloved wife of 55 years, Ruth Marie, passed away in November of 2011 after the debilitating disease ALS ravaged her body for nearly a year. It was excruciating for the family to watch our lively fun-loving mother so constrained by the end that she could move only her eyes, though her mental capabilities were sharp. She is dearly missed beyond words by our family, and by others who loved her as a mother and friend. We hang on to the assurance that our times are in God's hands. We are humbled and grateful to have been raised by two such precious and faithful Godly parents. Though we may not understand the constraints and limitations of the aging process, we can have confidence that God's purposes continue to be fulfilled during this fragile phase of life. "Can the clay say to the potter, what are you making?" and not to come from us."